Biochemistry offers three departmental scholarships to undergraduates that total more than $10,000 annually. 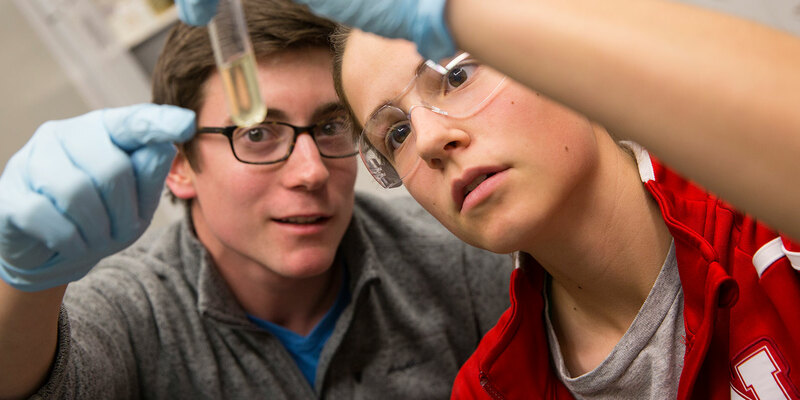 In addition, several science-specific awards for upper-classmen are available. Our students are highly competitive in university-wide and private scholarships. Collectively, they are awarded well over $1 million each year. Biochemistry is also proud to be a part of the prestigious Beckman Scholars Program. Students are selected in the spring term and are given a scholarship for their upcoming year to conduct research full-time during the summer and part-time as coursework allows during the academic year. The Weeks Scholarship has been established by Don and Rita Weeks to support the educational pursuits of undergraduate students from small communities who display exceptional ability to achieve scholastically and in campus and community life. Undergraduate Scholarships and Graduate Fellowships for $1,000/year ($500/semester) are available to students. Application forms are available online, in the Biochemistry Department Office (N200 Beadle Center) or in the Center for Biotechnology Office (N300 Beadle Center). Application materials are generally due in early March. Check the application for details. Applications are now available at the College of Agricultural Sciences and Natural Resources Dean's Office for the 2013-2014 Samuel and Martha McKelvie Scholarship. Scholarships up to $1,400 per year are awarded to current undergraduate students who are interested in a career in agriculture or natural resources. Undergraduate students from all CASNR academic programs are eligible. Current McKelvie Scholars may re-apply. Applicants must demonstrate high scholarship and give evidence of their interest in a career in agriculture or natural resources upon graduation. Recipients of the awards may apply for annual renewals. Renewals will be granted on the basis of academic performance as demonstrated by courses completed, work experience, and summer employment and/or internships. Application materials are generally due in mid April. Check the application for details.